BOSS brings the BR series right up to date with a very flexible machine. Easy to use; good effects. USB interfacing. Phantom power on one mic input only; data dial and four-way cursor can be a bit fiddly. Sonar software is Windows-only. The first new addition to the BR range since 2006. The control surface is traditional where it matters, modern where it needs it. The BR-800 is the first new entry in the BR series of personal multitrack studios for over four years, but brings things right up to date by incorporating a USB audio interface and software control surface functions, as well as a sleek touch-sensitive control surface. That aside it's business as usual - it's a portable, easy-to-operate machine that offers onboard rhythm programming and a host of onboard effects that can be recorded as part of the input signal, including some guitar and bass amp sims and effects derived, this time, from the GT-10/10B and vocal effects from the new VE-20. "When mixing you have a choice of adding either reverb or chorus/delay to each track, as well as setting the panning EQ and volume." Recording onto an SD card and running from batteries, the supplied power adaptor, or even via USB, the BR-800 is designed to be easily portable. It won't fit into a pocket but will easily slip into a small bag and is equipped with a pair of microphones so you can use it to record gigs and rehearsals in stereo. As a multitracker, it supports simultaneous recording of up to four tracks so, if you have the microphones available, you could easily use it to record a multi-mic'd live drum kit either for further overdubs on the BR-800 or for transfer to computer. Unfortunately, you won't be able to use a matched pair of condensers, as phantom power is available on just one input channel. If building up a backing track from scratch is your preferred way of working, the onboard rhythm generator - a stereo track completely separate from the recording tracks and based on the DR-880 drum machine - has a grand total of 327 rhythm patterns including intros, verses, fills and endings in a variety of musical styles. These can be sequenced to create a complete arrangement and the sounds can be chosen from a set of nine drum kits. There's no bass programming, but one of the insert effects for guitar is designed to shift the pitch so you get a bass guitar sound from your normal six-string. The insert effects cover four categories - electric guitar, acoustic guitar, bass and vocals - so you can transform all the input signals that songwriting guitarists are likely to use. Other features tailor-made for guitarists include a dedicated Hi-Z input, an onboard tuner and a couple of hands-free recording modes - one via an optional footswitch and the other implemented by programming punch-in and punch-out locations. There are also phrase-training facilities with looping, half-speed playback without pitch change and centre-cancelling. All this works both for stuff that you record and imported wavs. Like previous BR machines, the BR-800 supports virtual tracks - eight for each playback track. This effectively lets you store lots of different takes. For instance, you could have a crack at a solo up to eight times and keep the lot, choosing the best one at mixdown. When mixing you have a choice of adding either reverb or chorus/delay to each track as well as setting the panning, EQ and volume, plus a mastering effect can be added as you mix your song down to a spare pair of virtual tracks. Transferring the mix to computer is done via USB, as is archiving of data, but the USB connection can also be used for direct audio transfer, with the BR-800 acting as an audio interface with the ability to send two simultaneous channels of audio to your computer as well as support stereo playback. You can also set up the BR-800 to work as a hardware controller for various functions of your recording software. Cakewalk Sonar 8.5 LE software with full audio loops and backing tracks is included if you've yet to make a start in computer recording. There's nothing difficult about the BR-800. Anyone already familiar with the concept will probably be able to get up and running without opening the manual, while beginners will find that BOSS has introduced a couple of modes accessed via dedicated front panel buttons that will gently ease them into the world of multitracking. The first of these is EZ Record, which quickly sets up the input(s) and calls up an appropriate insert effect and rhythm pattern for the type of music you want to record. A second mode is Song Sketch, designed for instant recording of wav files - ideal for those occasions where you want to grab song ideas before you forget them. Sound-wise, the onboard mics do a really good job whether recording a band in the room or a solo acoustic guitar and/or voice, while the amp sims and effects are up to the usual excellent COSM standards with a whole bunch of classy electric guitar sounds and the option of connecting an expression pedal. There are also useful emulations such as those for turning a six-string electric into a bass or an acoustic guitar and modelled acoustic guitar body effects from the AP-1 preamp to make a plugged-in electro-acoustic sound like it's mic'd. All of the sounds can be recorded directly to your computer via USB, negating software amp sim plug-ins or a hardware amp and FX processor. The BR-800 is a great machine that most guitarists would find a host of uses for - besides being a multitrack studio, whether you simply use it as a musical sketchpad to knock song ideas into shape or to produce nicely polished master recordings, it can be on hand to quickly capture ideas, function as a location recorder (stereo or multitrack) and provide a useful phrase training and practice facility - just plug in, dial in an amp sound and play along with the rhythm tracks. Now, all of that may not sound too different from the BR series machines that preceded this one but the difference this time is in the USB functions. While self-contained hardware recording systems have loads of plus points, they have traditionally been a closed system and not as flexible as software recording systems. However, as Zoom did previously with its R16, adding audio interface and controller functions means that this type of machine doesn't have to be a closed system any more - it can be an integral part of a larger set-up if you choose. 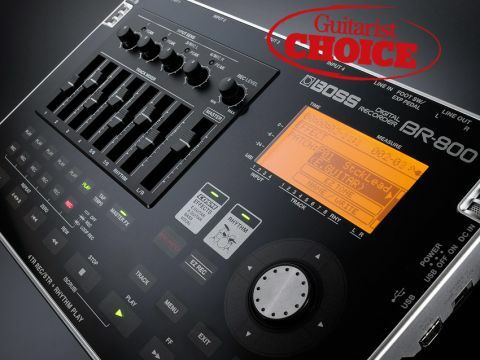 Used on its own the BR-800 is an extremely functional machine, but add in that you also get an amp-sim and guitar FX-equipped front-end for a software system and you're getting massive flexibility for your money.